Not all cat scratching posts are created equal, and if the one you choose isn’t quite right, your cat will be sure to let you know. Assuming the scratching post you chose meets with your cats’ approval, here are eight tips for getting them to use it. 1. Choose a scratching post that’s tall enough for the cat to get a good stretch and so stable it won’t topple over on her when she’s scratching. Most cats love using a post that’s about 33″ tall. 2. The best scratching pads are long and wide , so kitty can stretch out and take a nap after she’s done scratching. 3. Some cats are horizontal scratchers, some are vertical scratchers, and some are both. 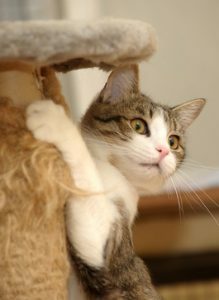 Before you invest in a scratching post or pad, observe your cat and try to determine her scratching preferences. 4. Put the scratching post at the entrance to a room you use often or against a piece of furniture the cat’s already scratching. A good location for a second post is near where she likes to sleep. If you bury the post in a dark corner somewhere, changes are she won’t use it. 5. Rub catnip on the post and sprinkle it on the base. 6. Hang an enticing toy from the top of the post. so she’ll go there to play. 7. Play with her beside the post. Drag a toy across the base so she can feel the surface as she’s chasing the toy and realize how much she likes it. 8. Never rub her paws up and down the post. That could frighten and upset her so much she’ll refuse to use the post.